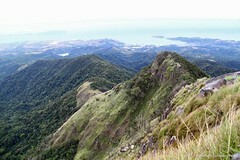 My first climb for the year took me to one of Bataan’s highest points. Tarak left me with two things. First, like a wordplay, I now understand how it got its name. The initial portion of the climb involves the usual wide trails through grasslands and flatlands. Three hours into this type of trek, you will reach the Papaya River where you break for lunch and the last water source. The second leg of the mountain’s assault leads to an exciting and almost two-hour cardiac trail. Steep and covered, you may need to hold on to branches and roots and climb using all four limbs for support. In two hours, you will arrive at the ridge where you will have a fantastic panoramic view at 1,006 MASL. Groups can choose to camp at an enclosed area before the ridge (which can accommodate roughly ten tents) or at the wider and open area at the ridge itself. This brings me to my next Tarak lesson.